Beach Haven Borough Hall is located at 300 Engleside Avenue, Beach Haven NJ 08008; phone: 609-492-0111. Beach Haven was incorporated in 1890. Photo: Sherbourne Farm, 319 Liberty Ave., Beach Haven, Historic American Buildings Survey [HABS NJ-1106], David Ames, photographer, fall 1991. Beach Haven is part of the barrier beach known as Long Beach Island and is bordered to the east by the Atlantic Ocean and to the west by Little Egg Harbor. Recent tract developments are located north and south of the Borough of Beach Haven. A grid street pattern, which was planned in the 1870s, has remained intact. Broad streets and small lots are common throughout the town. Of the three lots which exist, one is a yard, one an undeveloped lot and one is the site of an early hotel. The structures in Beach Haven are relatively evenly spaced, since almost all buildings are located at the street's edge and centered on their lots. No streets are lined with trees and few lots have large amounts of vegetation. The Beach Haven Multiple Resource Area is located near the southern tip of Long Beach Island, about four miles from the New Jersey mainland, contains 84 historic structures, primarily residences of which 77 were built in the late 19th century. More than 90% of the buildings in the area are residential and many of these structures are used only during the summer months. The buildings in town are mostly wood-frame and contain similar elements and materials, such as clapboard, cedar shingles and open porches. Both high-style and vernacular buildings co-exist, however high-styled structures are found, for the most part, nearer the ocean and more vernacular structures toward and along the bay. Many of the buildings in Beach Haven employ Queen Anne or Victorian Gothic elements, even those built by local craftsmen. The Beach Haven Multiple Resource Area, based on a comprehensive survey of the Borough of Beach Haven, New Jersey, contains elements which demonstrate the development, over a relatively short time period in the late 19th century, of a beach-front resort intended to attract wealthy summer residents from New York and Philadelphia. Although some of the major structures have been lost and the beach-front now contains modern motels, a large portion of the town retains its Centennial-era appearance, both in individual structures and urban form. Historically and/or architecturally significant elements within the Beach Haven Multiple Resource Area include: The Beach Haven Historic District, within which most of the nominated structures are located; two individual houses physically separated the District by a modern church on a city block-size lot and an 1874 farmhouse, physically separated from the district. Together these elements exhibit the most intact resources in a beach front resort which developed very rapidly about 1880. Unlike some other Victorian shore area towns, Beach Haven was not founded with any religious overtones; thus, no land was originally set aside for public purposes. What open space exists today is either the site of a vanished building or is a private lawn. Since the town was founded as a speculative real estate development, its urban form consists primarily of broad streets, in a grid plan, lined with large houses on lots. The large estate or ocean front compound, such as exists in New England shore resorts, was not built here. Additional significance arises from the fact that several of the buildings are known (and others suspected) to have been designed by a Philadelphia architectural firm Wilson Bros. and Company which had close ties to the Pennsylvania Railroad and the Baldwin Locomotive Works; partners in the latter company were instrumental in the founding of Beach Haven. The same architectural firm is known to have designed a bath house and railroad station in Cape May, New Jersey, approximately 60 miles south. Beach Haven and its surrounding area were first settled at the turn of the 17th century. Whalers were probably the first settlers to come to Long Beach Island and, by 1823, twelve whaling families are known to have lived along the shores of the Island. Some of the early whaling families began taking in summer boarders interested in fishing, hunting and relaxing on the Island. In 1815 Joseph Horner took in guests at his home south of Beach Haven. Seven years later Horner sold his business to Philadelphia guests who formed the Philadelphia Company Boarding House. These men remodeled Horner's home and turned it into a first class seaside hotel. By the mid 19th century other structures used as boarding houses and gunning clubs had been built along the shores of the Island, however these buildings were small, isolated settlements separated by miles of sand and dune vegetation. No planned town, roads, or organized transportation system to or on the Island existed. In the spring of 1874, Archelaus R. Phara of nearby Tuckerton, New Jersey founded Beach Haven. Named by his daughter, Mrs. Samuel Ashhurst, Beach Haven was later recommended by the American Medical Association as "one of the best three resorts in the eastern United States for hay fever sufferers." Pharo, a long time visitor to Long Beach Island, first envisioned a seaside town in the early 1870s for this purpose. Along with partners of Burham, Parry, Williams and Company (later the Baldwin Locomotive Works of Philadelphia), Phara formed the Tuckerton and Long Beach Building Association. Three structures were built by Pharo in 1874; two houses (on Second Street), one for the Pharo family and one for Dr. Albert Smith of Philadelphia, who had been a frequent visitor to the Long Beach House, a hotel located a few miles south of the town. The third structure built by Pharo was the Parry House, the first of a number of luxury hotels at Beach Haven, named after Charles Parry of the Baldwin Locomotive Works. The hotel, which could house 250 guests, stood at the present site of the Kynett Methodist Church at Beach and Centre Streets. A dock on the bay front and a "boardwalk road" on piers leading to it (now infilled and known as Dock Road), were also built in 1874. A map of 1876 outlines the early transportation system of the town. The Philadelphia or New York visitor to Beach Haven could travel by railroad to Tuckerton where a railroad spur leading to the bay had been constructed. At the bay the visitors boarded steamers which carried them to the end of Dock Road at Beach Haven. A.R. Pharo was influential in the construction of the railroad spur to the Bay in 1872 and Baldwin Locomotives were used by the Tuckerton Railroad, which may account for or demonstrate the company's interest in the development of Beach Haven. This early transportation system was also used to haul food and building materials. 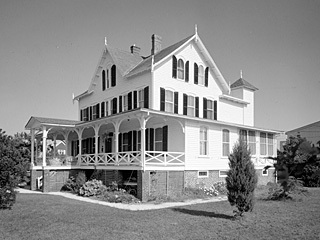 The success of the Parry House prompted the development of new hotels at Beach Haven. Robert B. Engle, operator of the Parry House, purchased a lot in 1876 to build a large hotel along South Street, now Engleside Avenue. The "Engleside," designed by Addison Hutton, a Philadelphia architect, could accommodate up to 300 guests and had its own gardens, cows and chickens. The Hotel stood at the present site of the town green until it was demolished in 1943. Many famous and wealthy people of the day visited the hotels as seen in the Engleside advertisements which listed its important guests. The Baldwin Hotel, circa 1885, was built to replace the Parry House which had been destroyed by fire in the early 1880's. The Baldwin, itself destroyed by fire in the 1960s, stood on Pearl Street at the present site of the new Holy Innocents Mission Church south of the Beach Haven Historic District. The hotel could accommodate 400 guests and was equipped with electric lights, hydraulic elevators and hot and cold running sea water. Smaller hotels and boarding houses were constructed during this time, including the Magnolia House at 215 Centre Street, and the Ocean House (now destroyed), both built in 1877. The large hotels found it necessary to establish bath houses, tennis courts and transportation to and from the steamboat landing at Dock Road to satisfy their well-to-do guests. In 1884 the Baldwin was connected to the steamboat landing by a railroad which ran along Beach Avenue from Pearl Street to Third Street. When started, the railroad used a small steam locomotive built by the Baldwin Locomotive Works. The Engleside also established transportation for arriving and departing guests. Beach Avenue, which contained the Beach Haven Railroad line, was the only north-south street in town until the 20th century. The avenue soon became the commercial center of town and was lined with a grocery store, a butcher shop (northwest corner of Beach and Amber), a barber shop, post office and a department store all of which still stand and now used as residences. Other shops were found within the Engleside complex and at street corners along Beach Avenue. Not until the construction of Bay Avenue in 1914 did Beach Avenue's role as a commercial center begin to decline. In 1886 the railroad from Manahawkin (to the north), was completed causing the demise of steamboat service. The railroad further promoted the development of the town, and a number of structures had already been built in anticipation of the new transportation link. In the early 1880s a number of public structures and homes for wealthy Philadelphians were designed by Wilcox Brothers and Company. The company was a newly incorporated engineering and architectural firm located in Philadelphia. The principal partners were John A. Wilson, Joseph M. Wilson and F.G. Thorn. The firm was known mainly for its work in railroad engineering. Thorn was trained as an architect, studying under John McArthur Jr. of Philadelphia (architect of its City Hall), and was responsible for many of the firm's designs. John A. Wilson, engineer, was the principal engineer for the Main Mechanical Building of the Centennial World's Fair in 1876. Organized in 1876, the firm worked on projects such as the Philadelphia Subway, the Philadelphia Reading Terminal, the Broad Street Station of the Pennsylvania Railroad, and hospitals, newspaper buildings, schools, hotels, and private homes throughout the east. The firm's interest in Beach Haven coincided with their association with the Baldwin Locomotive Works, the largest locomotive builders in the country. The company's main headquarters in Philadelphia were designed by Wilson Brothers and Company. The Baldwin Hotel was also constructed by the architectural firm, along with residential structures on Coral Street built for many organizers of the town. The 100 block of Coral Street contains three homes which were designed by the firm for Charles Parry, George Burnham, and Edward S. Williams. Other homes on the block, built for well-to-do Philadelphia, such as the Drinkers, may also have been constructed by the firm. These large cottages are typical summer homes of their era containing elements such as combination gable, gambrel or hip roofs, elaborate porches and window surrounds, towers and other decorative elements in various styles. All of these elements are uniquely and artistically arranged exemplifying the company's high standing in the architectural field. The houses at 504 and 506 S. Atlantic are very possibly the result of the Wilson Bros. and Co.'s designs. One of the most impressive structures designed by the firm at Beach Haven is the Holy Innocents Mission Church, now the Long Beach Historical Association. The church, circa 1881, was the first house of worship on the Island. This Stick/Shingle style structure has unusual elements such as railings, brackets and window tracery which employ trefoil arches. In the construction of the building the firm again shows its originality and expertise in the architectural profession. Like other important buildings in Beach Haven, the church was also associated with the Baldwin Locomotive Works. Mrs. Charles Parry, wife of the company's president, donated money for the construction of the church in memory of her daughter, Mrs. Clara Parry Hilger. Properties, both individual structures and historic districts, were selected for National Register nomination for their ability to illustrate the Borough of Beach Haven at its peak as a Victorian resort. The Sherbourne Farmhouse, although built the same year the town was founded, was an isolated structure, unrelated to the large-scale development taking place to the north (at what is now the center of town). An effort was made to convey the two forces of the resort: the summer homes of the wealthy urbanites, and the less impressive but no less important structures at the bay. Then, as now, there was a need for fishermen's cottages, docks, bars, and small hotels to complement the activities in the center of town. Since Dock Road was the main thoroughfare east for the steamboat wharf, this was a natural location for this grouping. Due to the loss of integrity of most of the properties around the landing site, the Dock Road neighborhood was excluded from this nomination. To a great extent the structures in the Beach Haven Historic District speak for themselves and reveal a great deal about the development of the town. Even a casual perusal shows that a) development took place over a relatively short time span; b) the buildings were constructed for people of means; c) at least one highly skilled designer was at work; and d) by inference, major beach front buildings and hotels are no longer standing. The Great Atlantic Storm of 1962 literally wiped away all beach front structures which have been replaced by modern, intrusive motels, detracting from the Victorian character of the Beach Haven Historic District and therefore excluded. The Hotel Parry and Baldwin was destroyed by fire and the Engleside was demolished leaving a "village green" in the center of the historic district and a prime location for development. Historical research documents amplify these assumptions. The involvement of the Baldwin Locomotive Works and the architectural firm of Wilson Brothers and Company adds more historical importance to the architectural significance which is self-evident. Beach Haven has been fortunate in retaining its identity amid the post-war construction boom that has drastically changed other parts of the Jersey shore. Its Victorian heritage, nearly intact, is present in the blocks of unified streetscapes within the Beach Haven Historic District, and the sense of the town's history is kept alive by the Long Beach Island Historical Association, which has as its headquarters the outstanding former Holy Innocents Church. No building better represents the community's beginnings, making this new use a fitting one. The Association maintains files, publishes brochures, and conducts walking tours, among its many activities aimed at preserving the area's past. Cramer, Fredric, cop., Long Beach Island, Its Pictorial Past. Toms River: Ocean County Historical Society, 1971. Files of the Long Beach Island Historical Association. Historic Sites of the Borough of Beach Haven. By the Beach Haven Bicentennial Committee, 1976. History of Holy Innocents' Parish, 1882-1974. By the Holy Innocents' Parish 1974. Kraft, Bayard Randolph. Under Barnegat's Beam. New York: 1960. Nash, Charles E. The Lure of Long Beach. Long Beach Island: L.B.I. Board of Trade, 1936. The Beach Haven Times, 29 August 1968, 15 October 1975, July 1976. The Sandpaper, 29 October 1980. The Summer Times, 20 July 1977. "Walking Tour of the Victorian House South of Center Street, in Beach Haven," By the Long Beach Island Historical Association. Wilson Brothers and Company Catalogue of Work Executed. Philadelphia: Lippencott and Co., 1885. Michael May, Heritage Studies, Inc., Beach Haven Multiple Resource Nomination, nomination document, 1981, National Park Service, National Register of Historic Places, Washington, D.C.